Mention has been made of the need for clean, neutral boiler feed, free from dissolved gases and of the consequent use of efficient de-aerators. Figure 1 shows one of several which liberate the dissolved gases from the feed and provide a measure of feed heating simultaneously. This type of de-aerator has a great range of capacity and given a temperature rise of at least 20 deg C, an oxygen content of 0.2 cc/litre can be reduced to 0.005 cc/litre, when working between one-half full load and full load in a closed feed system. Normally, the de-aerator is mounted directly on a storage tank, into which the de-aerated water falls, to be withdrawn through a bottom connection by a pump or by gravity. The tank usually has a capacity sufficient for 10 minutes' running supply of water but this is not necessarily the case. 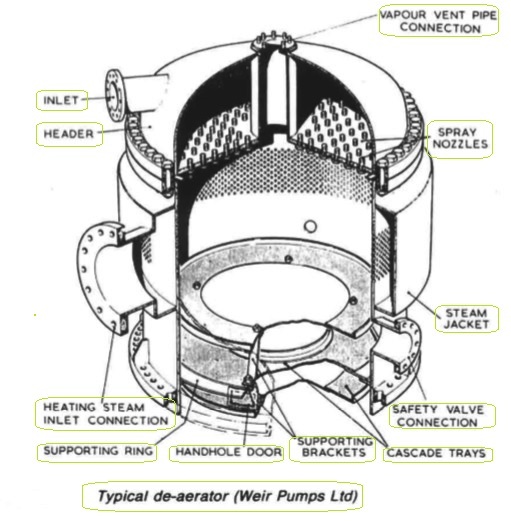 The feed water enters the de-aerator head and so that its surface area may be increased to the maximum possible, it is divided into sprays of minute droplets by being forced through the spray nozzles into the shell; here it meets the heating steam and is brought rapidly to its saturation temperature. Most of the dissolved gases are released and with some vapour rise to the vapour release opening. The header may be divided and provided with two feed inlet connections, so that the efficiency of de-aeration may be maintained at low rates of flow, by reducing the number of nozzles in use. Three cascade trays are set one above the other in the lower part of the shell. The upper and lower of these trays have a raised lip on the outer periphery, have the central opening blanked and have a series of perforations arranged in rings towards the raised lip. The middle tray has a central opening with a raised lip and is perforated similarly. The falling spray collects on the upper tray and is again broken up as it passes through the perforations to the middle tray where the process is repeated, to be repeated again as it passes through the lower tray to the tank below. The combination of spray, heating and cascade ensures the liberation of all but a minute fraction of the gases in solution or suspension. The final water temperature depends upon the pressure of the controlled steam supply.